Darmstadt, the capital of the grand duchy of Hesse, and of a circle of its own name, in the province of Starkenburg, situated on the small river Darm, 16 m. S. of Frankfort, and 32 m. N. of Heidelberg; pop. in 1871, including the suburb of Bessungen, 39,584, mostly Protestants. The new part of the town contains beautiful streets and squares, and fine pleasure grounds-. The old town with its narrow and crooked streets is in the background, and none of the great thoroughfares pass through it. Among the remarkable buildings are the ducal palace (with a library of 450,000 volumes and 4,000 MSS. ), the diet house, the mint, and the Catholic church, built after the model of the Pantheon at Rome. There are galleries of pictures and of statuary and coins, a museum of natural history, two colleges, a gymnasium, various other schools, including one for the education of artisans, a house of correction, iron founderies, breweries, 15 printing offices, a botanic garden, a military academy, an extensive armory, and many scientific and artistic societies. There are charitable institutions for the benefit of poor young girls and for orphans and widows, and a deaconess institute established in 1857. The manufactures are linen and woollen fabrics, carpets, cards, jewelry, watches, hats, wax candles, musical, surgical, and mathematical instruments, colored paper, starch, and coaches. Six railways centre in the city. - Darmstadt, which toward the close of last century contained only about 7,000 inhabitants, is greatly indebted for its growth to the grand duke Louis I., who founded the new town, and whose statue, surmounting a Doric column 134 ft. high, adorns the Luisenplatz. The Theaterplatz has contained since 1852 statues of Philip the Generous and George I. A bank of commerce and industry was established in 1854, and the bank for southern Germany (Zettelbank) in 1856. In the 11th century Darmstadt was a village, and in 1330 it was made a town by Count William I. of Katzenellenbogen. On the extinction of that line Darmstadt passed into the hands of Hesse. In 1622 it was taken by Mansfeld, and in 1647 by the French. 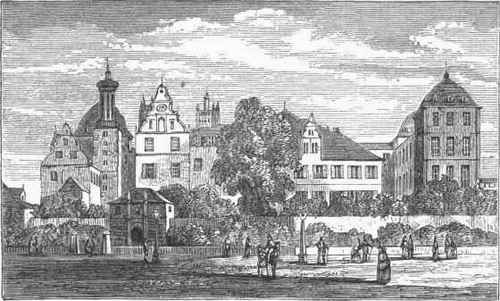 Public conventions have been often held in Darmstadt, and a customs congress in 1854. The court theatre was destroyed by an incendiary, Oct. 24-25, 1871.